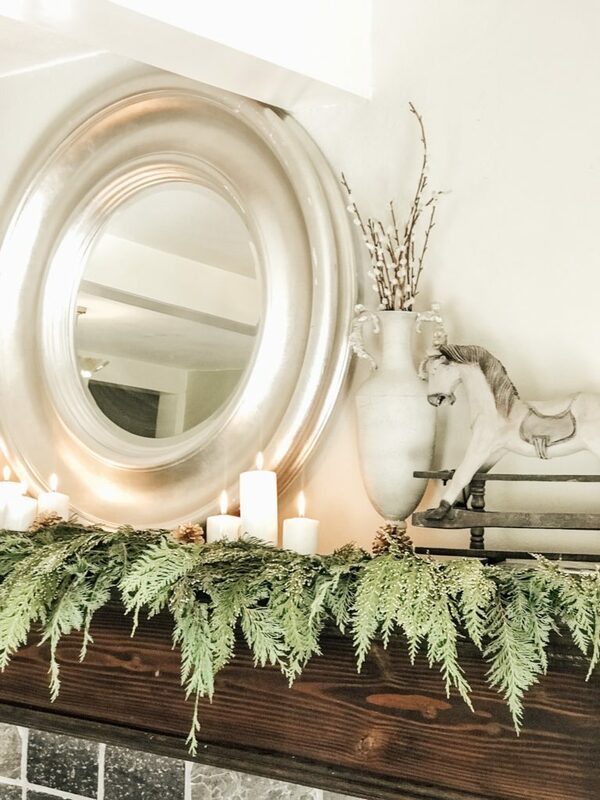 Ok, so honestly sometimes decorating for the holidays is more stress than it’s worth. 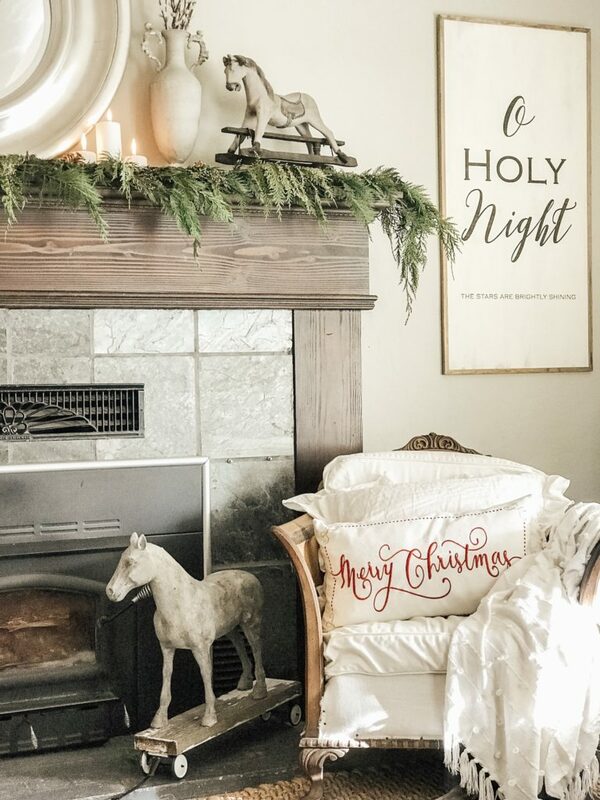 Don’t get me wrong I love Christmas decor and keeping it natural. But the day I decided to get the Christmas mantel done was one of those days when I should have just gone back to bed. It all started the night before. I was stressed out on trying to get some rush order shipments out on Friday morning, I had two minutes to spare by the time I got to the post office. 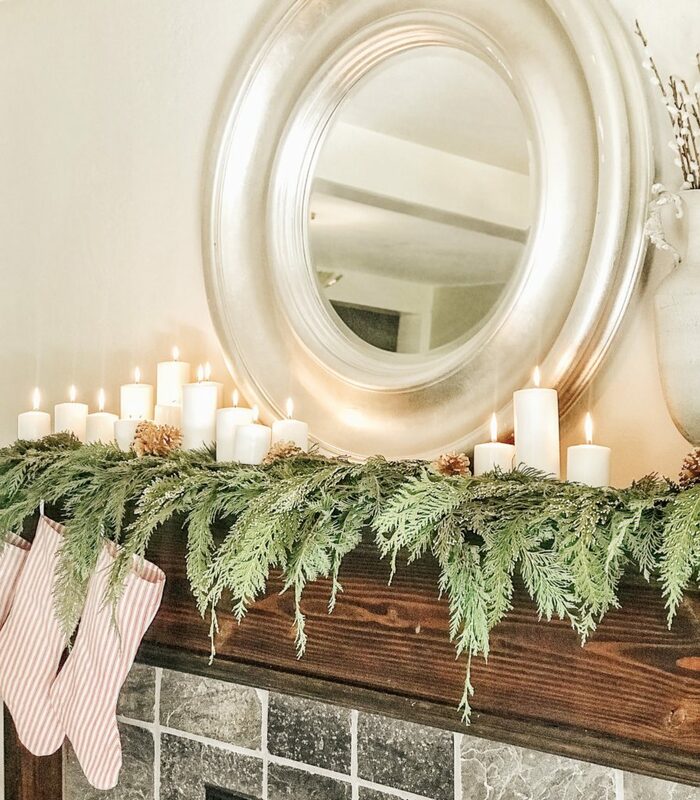 I came back and decided to get Our Modern Farmhouse Christmas Mantel decorated and it all went downhill from there. I destroyed a chair, I nearly caught the house on fire, I got all wet and disheveled the branches from the cedar boughs. Then I actually ran to Walmart and bought the white candles and was totally disappointed with the low quality and the high price. The candles were needed right away, I should’ve known better. I really wanted the Pottery Barn battery operated ones. I only have two and I really need a lot more. But Pottery Barn is an hour away and I was decorating that day. So to start decorating the mantel I put up the boughs of cedar and realized I didn’t have enough so I had to go back outside again.But I didn’t want to clip from the same tree, as it would start looking sad. Then I found some Leyland Cypress that really wanted to let me clip them. The issue is that I had to trudge through knee high scrub brush. 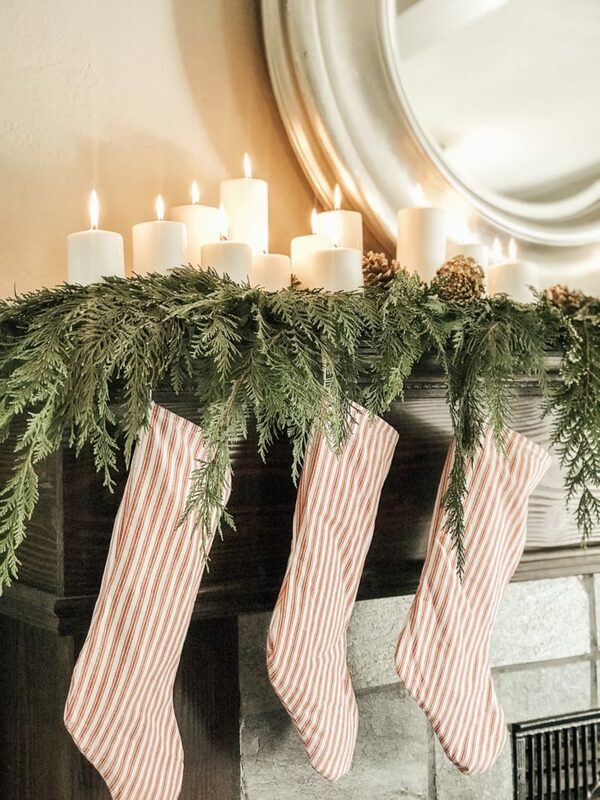 I added a special touch of you farmhouse ticking stripe stockings. They add that farmhouse look. Then I had to get back in the house and I had to take all the cedar boughs down that I put up first. Now I could lay down my Leyland Cypress and now put on the cedar. The Cypress really helped to give the Cedar height. If you are still needing to find the perfect gifts or even decorate your home, I have a great post for Christmas shopping on Etsy. I also give you the do’s and don’ts when shopping on Etsy. Next came the part of placing the candles. As you could guess it was easy for them to hide behind the greenery. I used books, napkin ring holders, and tupperware containers to stack the candles. Getting different heights on the candles really makes the space come together. I love how it turned out, however it was actually a lot of work because I think I took this down about three times. The decor on the right hand side of the mantel was the hardest part of this. I wanted simplicity, but needed height yet without too much clutter. I considered tall candle holders. A large horse, that is now on the hearth of the mantel. I tried a lantern and all sorts of things. I ended up using the smaller horse and a vase. That cozy throw down in the basket is from BeCozi, I have a coupon code for you to use R10, to get 10% off you order. These make wonderful gifts for Christmas. 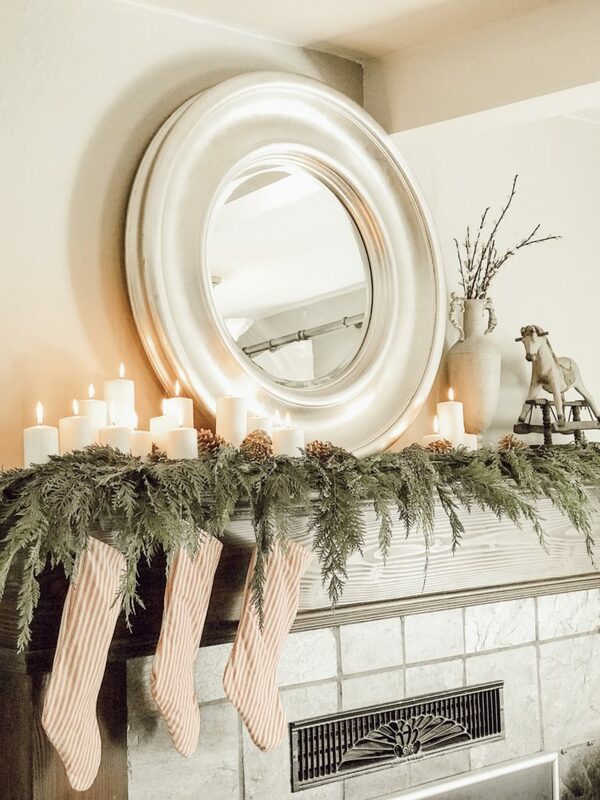 I’m joined by a group of my talented blogging friends who are also sharing their holiday mantel and vignettes ideas with you. 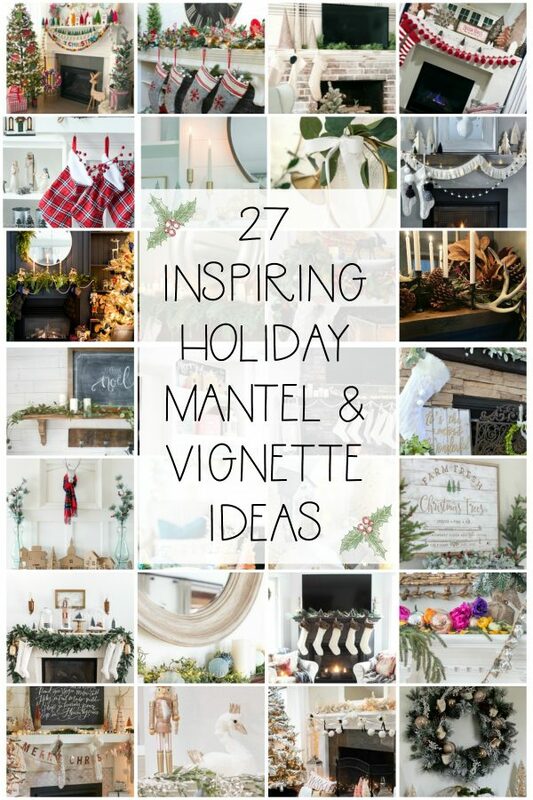 So become inspired and check out their beautiful posts below! Just lovely. When I started staging my vignettes, I wrapped books for height. Then I happened upon some Lucite U shaped file holders in an office supply store. I turn them upside down and they work great as the set included three sizes. I can tuck something small under the large one in my display. PS “Learn to return” Take those candles right back to Walmart now that you have taken the photos. Buy the ones you really wanted ! Beautiful simplicity ❤️ Absolutely love it! 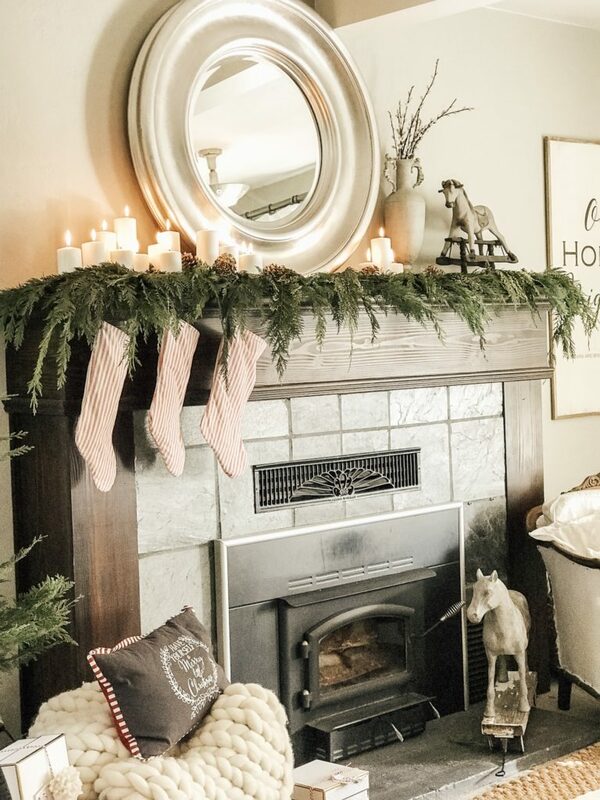 I love the way you decorated the mantel. Great Job! I worked all day yesterday putting up Christmas. It does get one in the holiday mood but it is a daunting task of which I’m still not done. I, too, love candles and I’m going out today after work in search for some more. Paul and I went to Bath and Body Works and picked up some wonderful winter scents for our night lights…Oh, the smell of balsam in the air. It’s beginning to look and smell a lot like Christmas in our house. 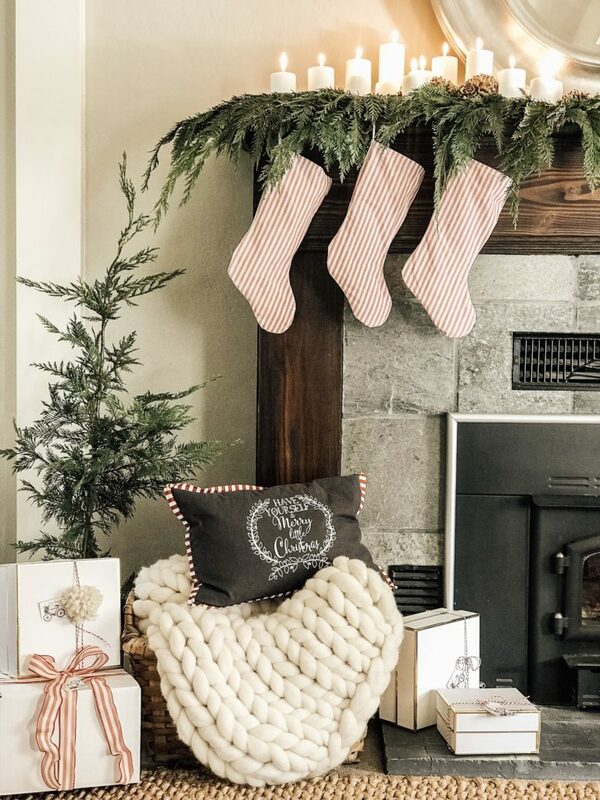 You sure know how to bring out that warm and cozy feel to the holidays! Thank you! Yes it’s getting to be Christmas time around here too. I think I’ll need to grab some Christmas candles to fill the air. So pretty, Rhonda! 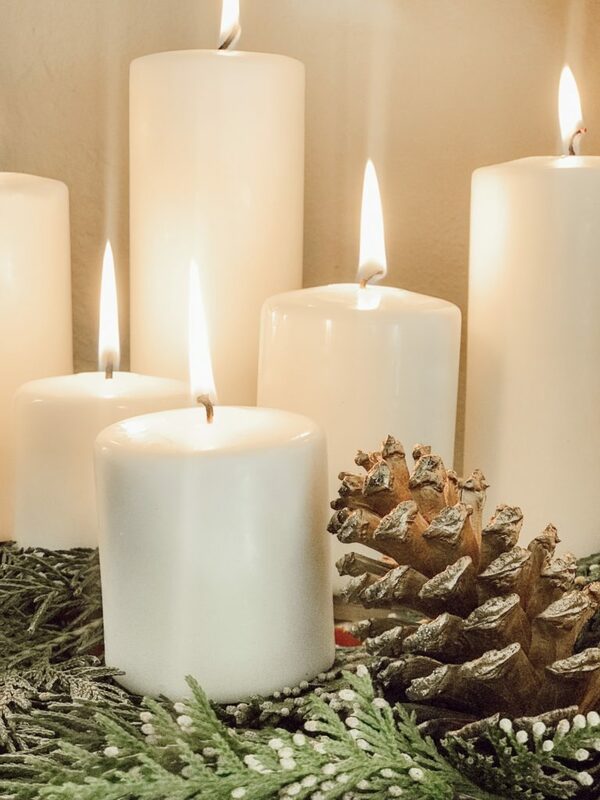 Love the candles and the greenery together. 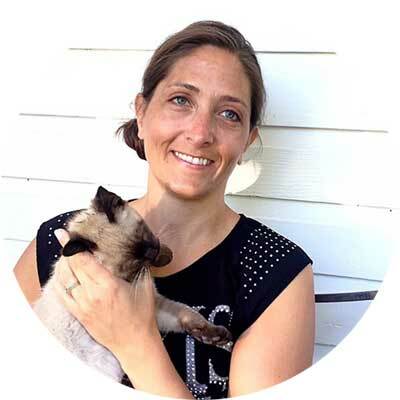 Thanks for sharing Rhonda and being a part of the blog hop. All your hard work paid off, it looks beautiful. Thank you Krista this has been such a fun hop! 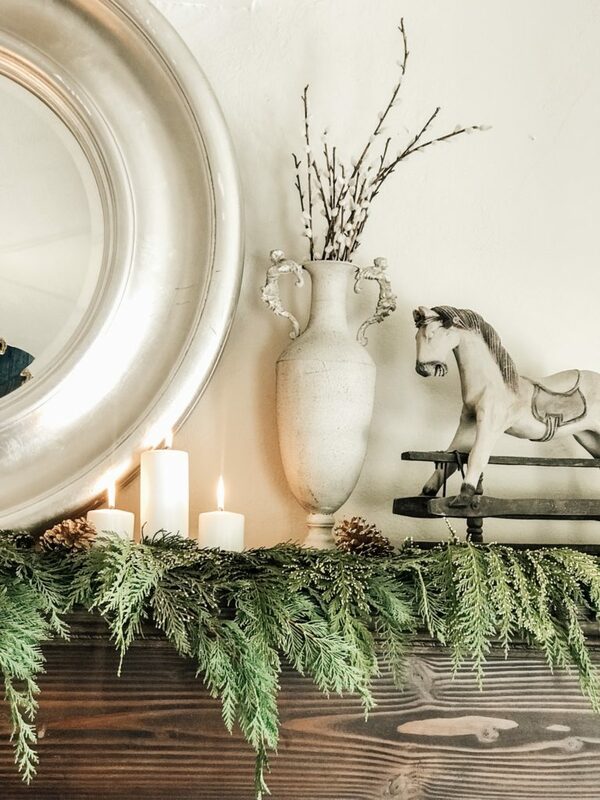 I love the real greens on the mantel. You’re so lucky to have them in your yard too. I would be putting that all over the place! 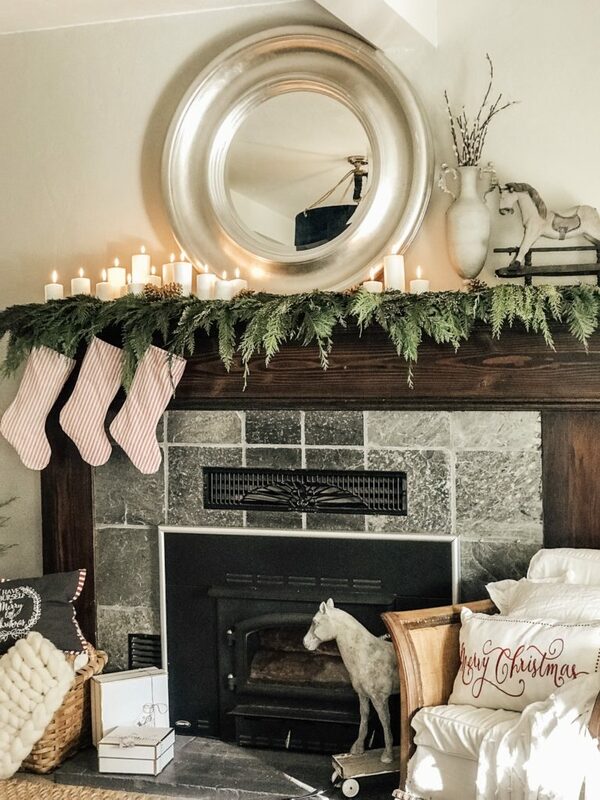 Love how soft and romantic your mantel is. 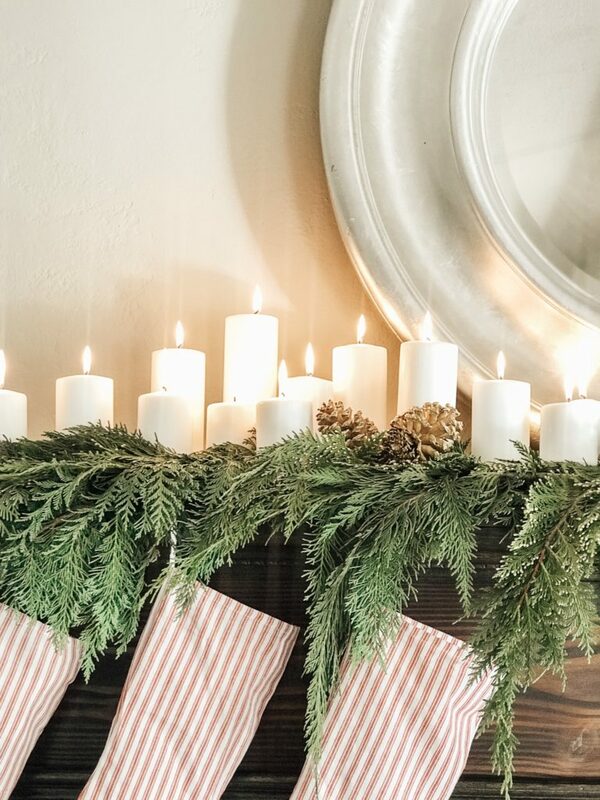 I absolutely adore all your holiday decor! Love it, Rhonda! SO warm + inviting!